Do you think that bitcoin might be a great investment, but don’t want to ride the roller coaster of volatility? Do you wish you could invest in bitcoin while reducing the sting of sudden swings in price? If so, this post is for you. Over the last 8 years, bitcoin has made headlines for its violent movements in price. With unprecedented jolts, both upwards and downwards, bitcoin tests the emotions of people who own and trade the world’s most popular cryptocurrency. It feels good when your investment goes up 10% in a single day, but terrible when the market moves against you. We aren’t going to dwell on the reasons for this volatility, but suffice it to say that as bitcoin matures into a globally trusted store of wealth, its volatility should continue to decrease. But even though the price is much less sensitive today than it was a few years ago, it still bounces around enough to make the average investor dizzy. Let’s start by taking a look at an example of what can happen if you don’t have a disciplined strategy to handle volatility. Imagine that it is January 1st, 2013. Bitcoin is trading at about $13 per coin. You decide to speculate a little and buy 10 bitcoin for $130. By October 30th, bitcoin is at $194 per coin, netting you a comfortable $1,810 gain from your initial investment. Wow, what a ride! You wish you had bought more. You decide to be responsible and sell half of your bitcoin. But the fun isn’t over yet. Despite the incredible rise up to that point, bitcoin hasn’t even gotten started. By November 30th, 2013, bitcoin is now trading at it’s all time high of more than $1,100 per coin. You start to panic. Maybe you shouldn’t have sold half of your bitcoin? You still have 5 BTC, or $5,500 worth, plus the $970 in cash that you received when you sold the other half. But what if this is only the beginning? What if bitcoin is going to $10,000 next? So you buy. But this time, you empty your entire savings account, and scrape together $20,000. Bitcoin is going to the moon and you are going all in with more than 18 BTC! Then December 1st rolls around and the price drops 10%. Uh oh. That doesn’t feel good. But the real pain is yet to come. Over the next 18 months you watch your precious investment slowly disintegrate, bottoming out at under $200 per coin. Congratulations, you’ve turned $20,000 into $3,600, a -82% return. We’ve all probably heard stories like this one before. Some of us are unlucky enough to have lived through something similar. The bad news is that we can’t change human nature: people will always buy and sell assets with some degree of emotion involved. The good news is that there is a simple, time-tested strategy for combating high volatility known as dollar-cost averaging: investing the same amount of money on a regular basis (e.g. buying $50 worth of bitcoin each month, regardless of price). Using this technique allows you to dramatically reduce your risk, while giving up some potential returns. Let’s take a look at a short analysis to demonstrate just how powerful the effect can be. For our comparison, we’re going to model the finances of Jill and Bob. Both have an extra $50 every month that they would like to save or invest. Jill decides to put her money into bitcoin, and Bob, who is a little more risk averse, decides to keep his money in cash. 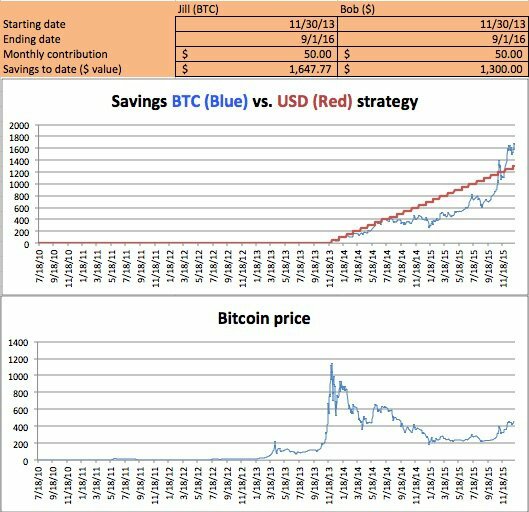 We’re going to see who has more in savings after a couple different time frames, to determine whether dollar-cost averaging really protects us from troughs and spikes in the bitcoin price. We’ll examine two different starting dates, and for our end date, we’re going to roll back the clock 7 months ago to September 1st, 2016 when the price of bitcoin was $450. This is a good place to stop because since then, the price of bitcoin has skyrocketed and a bitcoin holder couldn’t lose money if they tried. First, let’s have a little fun, and imagine that Jill and Bob began their parallel journeys on August 1st, 2010. The price of bitcoin on that day was $0.05 per coin, and for her first contribution, Jill collected 818 BTC. No, that’s not a typo! Bob, meanwhile, stashed $50 under his mattress. Here, the story gets a little more interesting. Immediately following the crash in bitcoin price, Bob pulls ahead of Jill, and continues to do better for almost 2 years. 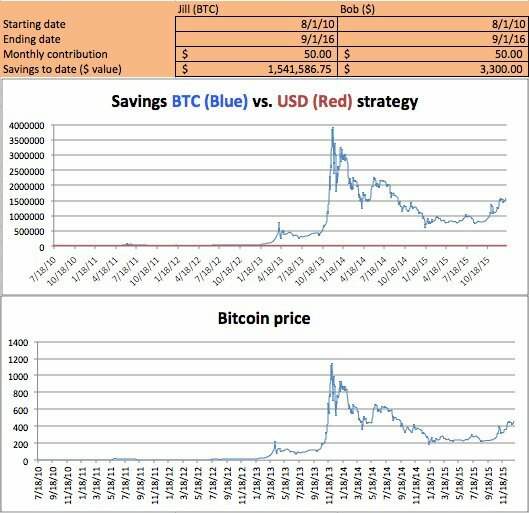 But because Jill was accumulating so much bitcoin at depressed prices, when bitcoin began to rise again, the value of her savings tripled. Starting at $1,100 per coin, riding the grind to $200 and ending at $450 per coin, Jill’s final balance actually beat Bob’s by $348! That’s how dollar cost averaging protects you in the long run: you end up buying less of the asset when the price is high, and more of the asset when the price is low. Over time, the dips helped Jill to accumulate more bitcoin, and the deeper the dips, the more upside she realized when the price rebounded. This technique is great for people who believe in the potential of bitcoin, but don’t want to make a mistake and time the market incorrectly. By setting a regular buy of a fixed dollar amount, you’ll be able to feel comfortable with your bitcoin investment despite which direction the price goes in the short run.